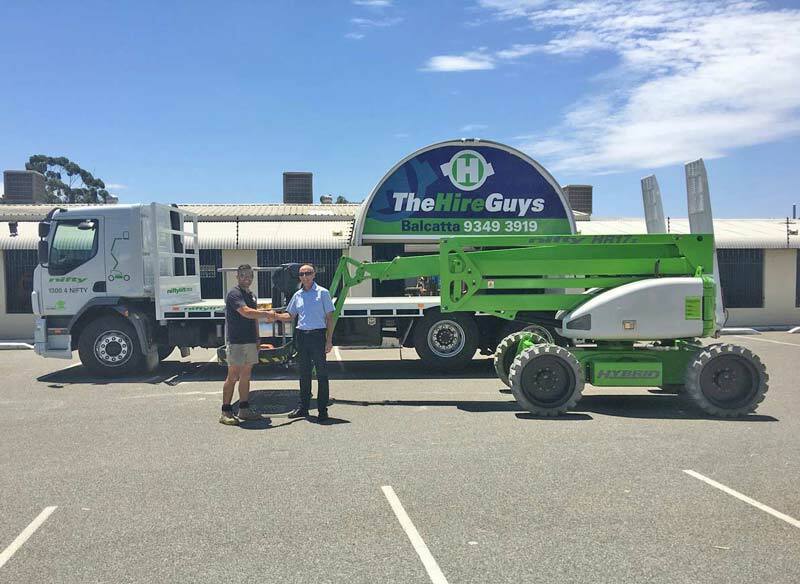 The Hire Guys, Balcatta on the north side of Perth, have purchased a 50ft Nifty Height Rider 17 4×4 Hybrid self-propelled articulated boom lift. They have recently taken delivery of the machine with a personal visit from Nifty’s John King. The company is one of three independently owned The Hire Guys stores in the Perth area and until now the company only ran trailer lifts. The company has also acquired a six tonne truck with tilt-back bed for delivering the unit to customers. “We talked with John King and had a look at the Nifty website. The Nifty Height Rider17 4×4 Hybrid, ticked multiple boxes such as height-to-weight ratio and versatility – as either diesel or zero emission electric, and rough terrain all in one. Add the advanced SiOPS secondary guarding safety features and modular ToughCage design and it made it a no-brainer for us.